Do you want to feel happier, more energetic and “in the flow” — no matter what life throws your way? What if you had more clarity, ease and a sense of thriving on every level? 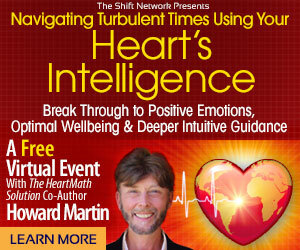 If you’re ready to shift into living from a higher baseline for Navigating Turbulent Times Using Your Heart’s Intelligence: Break Through to Positive Emotions, Optimal Wellbeing & Deeper Intuitive Guidance with HeartMath pioneer Howard Martin. 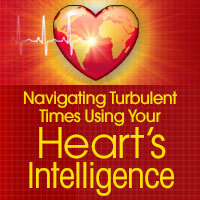 Heartmath is THE premier institution dedicated to the higher potentials of your heart. They’ve advanced the technology and practices that allow you to link your heart with your brain and create a state of natural coherence. Reserve your space at the link to discover simple, heart-based techniques and scientifically validated methods for activating healing and bringing more vitality and inner peace into your life. I hope you can join me for this fascinating virtual seminar! P.S. During this special session with one of Heartmath’s founders, you’ll discover how heart “coherence” can help you transcend stressful circumstances, experience a deeper sense of wellbeing, and improve your mental functions and physical performance. You can register here for Navigating Turbulent Times Using Your Heart’s Intelligence: Break Through to Positive Emotions, Optimal Wellbeing & Deeper Intuitive Guidance. A recording will be provided later to all who register, whether or not you listen to the scheduled event.